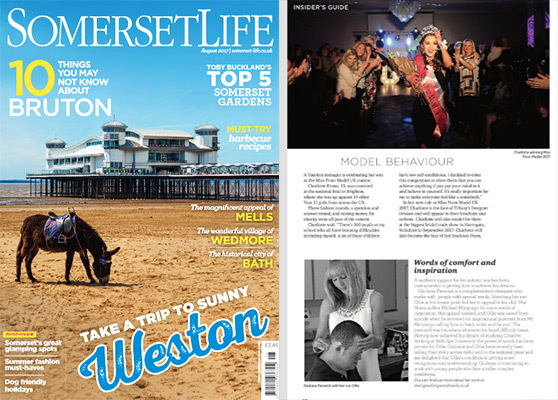 I am so very thrilled to be featured in the August 2017 issue of Somerset Life , part of the MediaClash magazine group , following the interview for BBC Radio and the recent national press coverage about the journey with my own son as I continue to raise awareness about these beautiful and wonderful and ABLE children and young adults. As a Somerset girl this feels very special! There was just one error (rectified in the following issue ) : the photograph is of myself with a student in one of my schools, and not my son Ollie as stated.However it is a lovely, lovely article and I’m a happy and proud little Somerset lady who is just honoured to have my work featured. Please click on the image below to see my feature on page 18 of the Somerset Life August edition. Alternatively, please click here to see the entire edition.